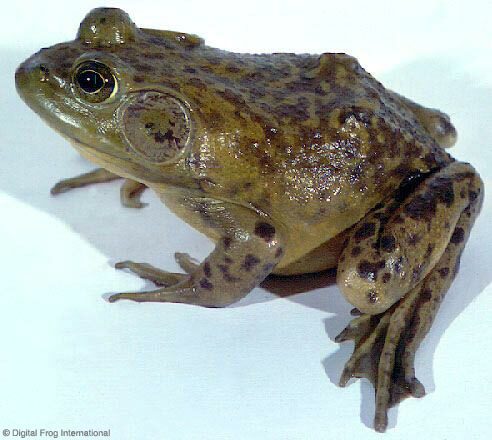 From detailed anatomy drawings and animation to photos of frogs in both their living and skeletal forms, here are just a few of the hundreds of frog and amphibian images from The Digital Frog 2.5, our virtual frog dissection, anatomy and ecology program. Feel free to use them in your school project, lesson, presentation—any non-commercial use is fine by us. 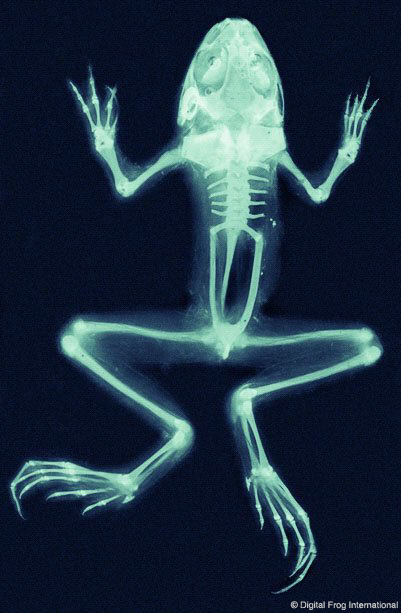 All of these pictures are from The Digital Frog 2.5 , our virtual frog dissection, anatomy and ecology program. The images, plus hundreds of others, are all part of the program, and can be used in school projects, presentations or lessons. Want to try the program for yourself? Get the full program and explore for 24 hours. 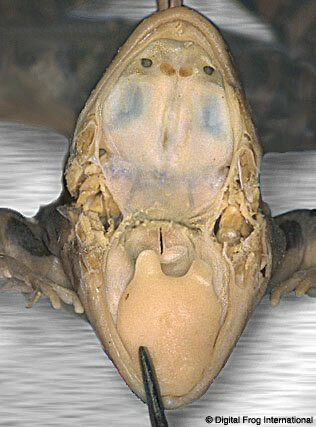 Close up of the inside of a frog's mouth. The angle of the jaw has been cut to better expose the internal structures. 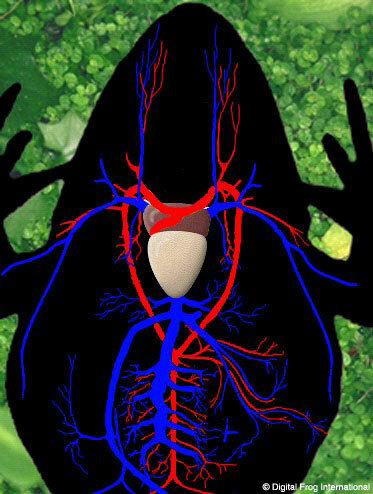 A diagrammatic view of a frog's circulatory system, showing the placement of the heart, arteries and veins. 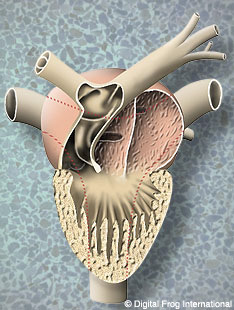 Illustration of a frog's three chambered heart. 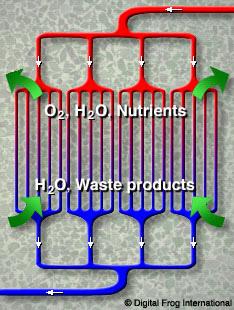 Schematic view of a capillary bed, showing what products enter and leave the blood stream. 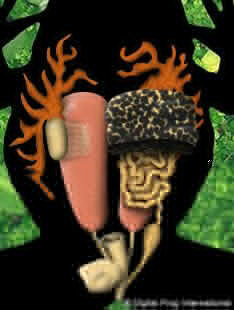 Schematic diagram of the organs of the urogenital system of the male and female frog. Animation of the steps involved in mitotic division. Animation of the steps involved in meiotic division. 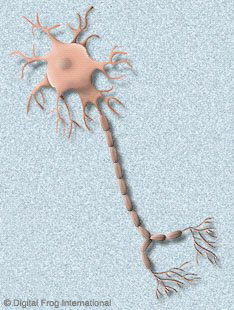 Illustration of a myelinated neuron (nerve cell). 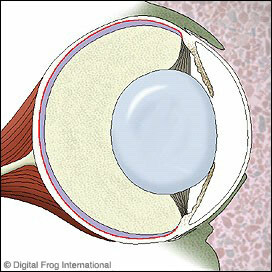 Illustration of a cross section of an amphibian eyeball. 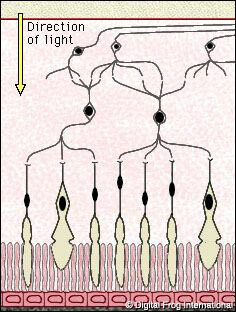 Schematic representation of the frog retina. A see through frog! Wow. 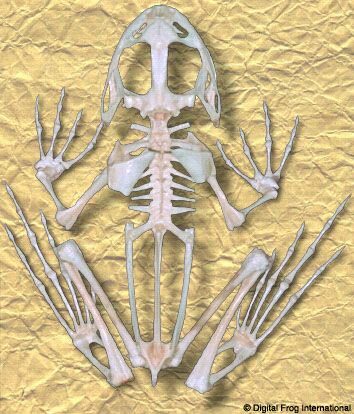 A picture of the complete skeleton of a frog (top view). A picture of Psuedacris crucifer. 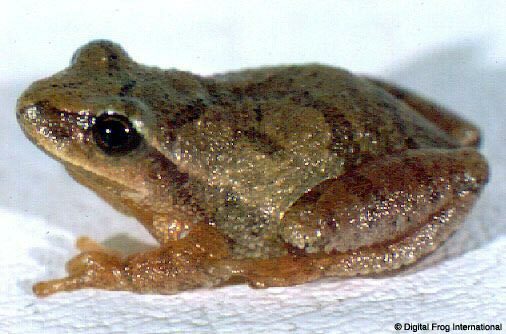 A picture of a Rana catesbeiana. Please note: You may not use any media from this site for any commercial applications without written permission from Digital Frog International Inc. This media is copyright Digital Frog International Inc., and is bound by the terms of the DFII License Agreement.